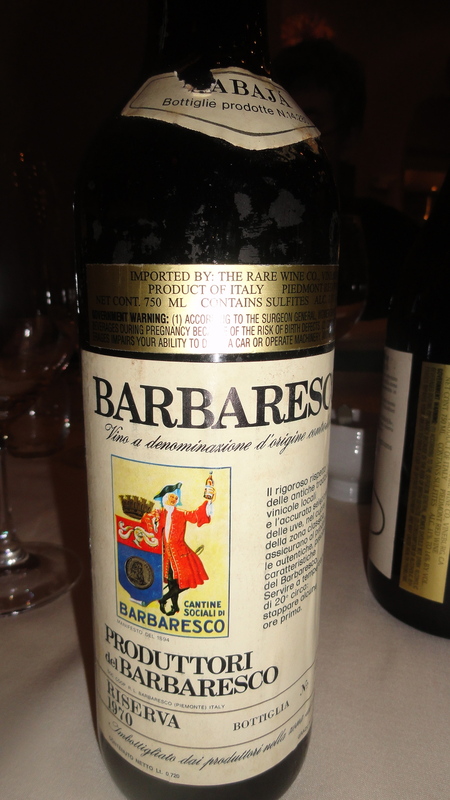 When a few members of my wine group were closed out of a tasting of the 1978 Barbaresco crus from Produttori del Barbaresco, we decided to organize our own. 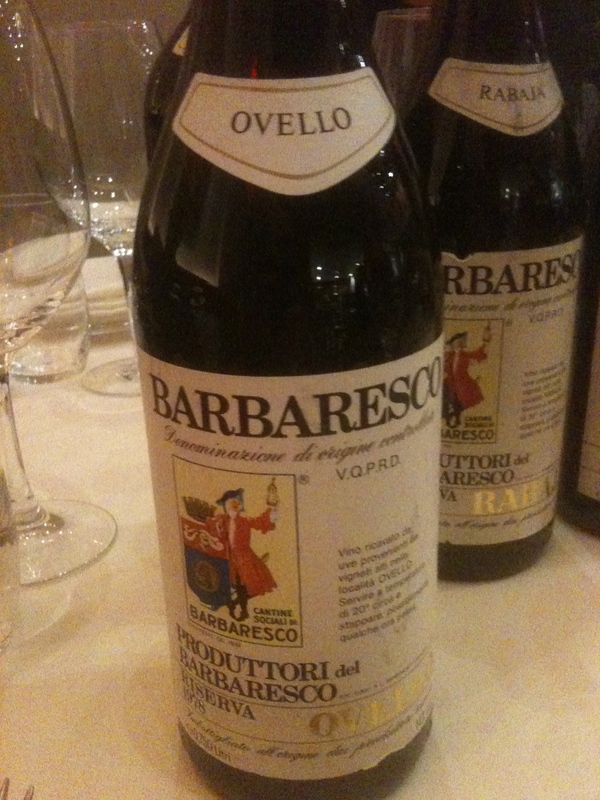 Produttori del Barbaresco is a wine cooperative, arguably the best in Italy. It has roots going back to 1894 when there were 19 members, but the co-op as we now know it dates from1958. Today there are 56 members. Over the years, a few members have left the co-op to go out on their own. Produttori has 100 hectares of Nebbiolo in the Barbaresco Appellation, 1/6 of the area. Each grower makes his own decisions as far as growing the grapes is concerned. In great vintages, nine single vineyard Barbaresco’s are produced within the boundaries of the village of Barbaresco: Asilli, Rabaja, Pora, Montestefano, Orvello, Pagé, Montefico, Moccagatta and Rio Sordo. The co-op takes great pride in these wines and the name of the single vineyard, the total number of bottles produced, and the name of the owners of the vineyard are on the label. The 1996 Ovello Riserva, for example has on the label the name of the single vineyard, the number of bottles produced (18,145) and the names of the vineyard owners: Cravanzola, Gonella, Maffei, Vacca, Varaldo. In his book Italy’s Noble Red Wines, Wasserman states in the section on Barbaresco, “There are a few producers making Barbaresco in the same class as the wines of Produttori, but none who surpass them.” In the years since this was written I have drunk many bottles of Produttori and it is as true now as it was then. All of these single vineyards basically have the same soil, calcareous limestone with sandy veins. The only difference is in the exposure. The grapes are hand harvested. They are also vinified in the same way. Traditional fermentation takes place with 18 to 20 days skin contact and aged for 36 months in oak barrels of 25 to 50 HL and 8 months in barrel before release. All of the single vineyards are reserve wines. Montefico 1979– the vineyard is 8.4 acres and it is at 250 meters with a southern exposure. The first vintage was in 1986 and today there are about 6,000 bottles produced. This was the wine of the afternoon. 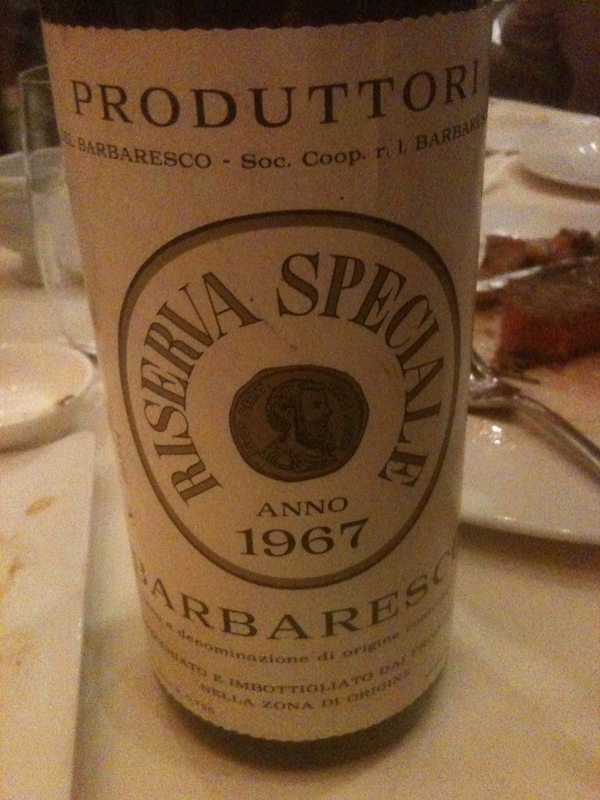 It was ready to drink with all the flavors and aromas of a classic Barbaresco. 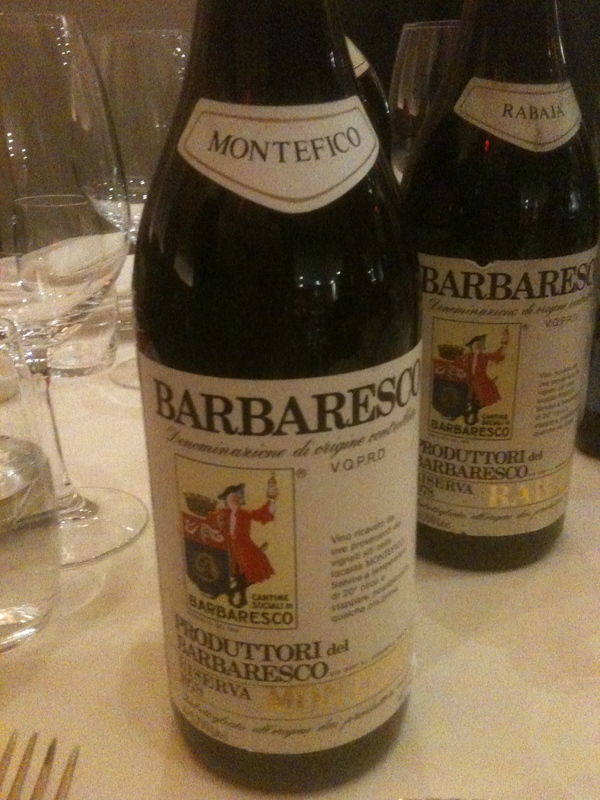 Montefico 1978 – it seemed to have more body and structure than the 79, and seemed to need more time. Ovello 1978 – The vineyard covers an area of 16.25 acres at 290 meters with a south/southeastern exposure. The first vintage was 1970 and there are about 18,000 bottles produced today. Since the 1996 vintage, Ovello has become my favorite. Rabaja 1978 -The vineyard covers an area of 11.5 acres with a southwest exposure at 320 meters. The first vintage was 1967 and there are about 14,000 bottles produces today. This was a complex well-structured wine with a great finish and aftertaste. Rabaja 1970. Wassermandescribed this wine this way: “Rich bouquet, intense and full of fruit, has a nutlike aspect; velvety, elegant, heaps of fruit, very nice indeed and quite ready; some tannin and a lot of fruit; should last.” Seems like he was covering all the bases here. He tasted the wine in 1980 and he was right about the last part- the wine did last! Pora 1967 The vines cover an area of 18 acres with a south/southwest exposure at 300 meters. The first vintage was 1967 and there are about 18,000 bottles produced today. This was in very good condition showing very little sign of age. 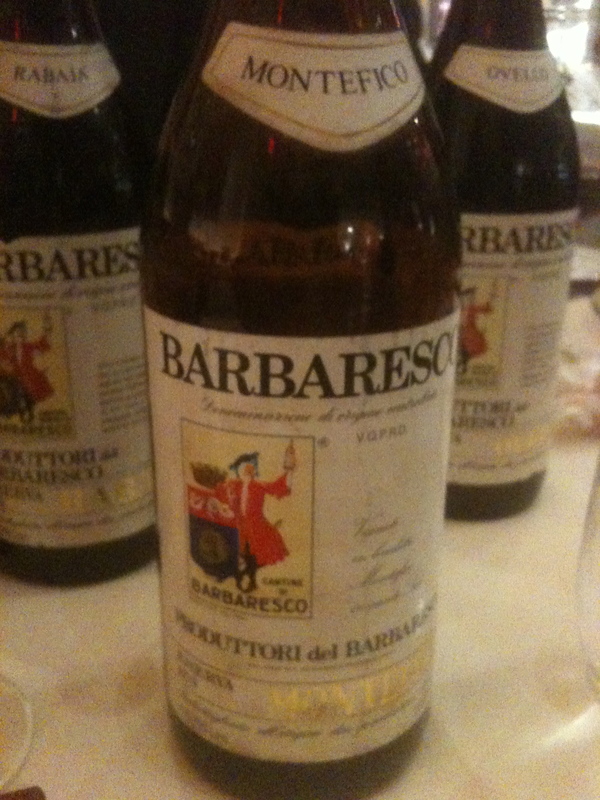 I agree that Produttori makes fine Barbarescoes, but to say that they are the best is overstating the case. Bruno Giacosa and Marchei di Gresy, to name two, are at the top, I believe. Ciao Ed – I agree that Giacosa and Marchesi di Gresy are top producers and two of the best. 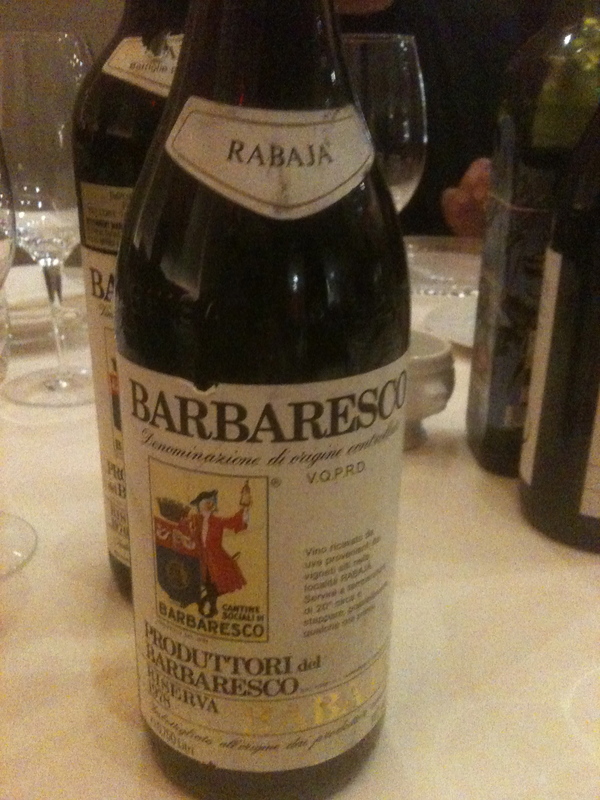 However, in my opinion over the long run going back to 1958, Produttori del Barbaresco has been more consistant and makes wines that age longer. Yes, an exceptional track record from this producer. I’ve written about these wines many times in glowing terms and am running out of anything new to say about them. Simply the best! You have the best tastings. I need to start a serious wine club over here. Ciao Sarah- I try my best and could not do it with out my friends in the wine groups.